1. 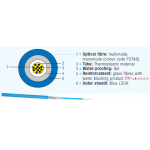 Optical fibre : Multimode or singlemode (FOTAG color code)2. Tube : Thermoplastic material3. Tube waterproofing :.. 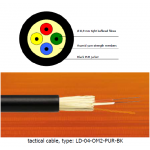 This specification covers optical armored cables with 2 or 4 fibers. The LDA tactical cable is equippedwith stainless steel tube and stainless steel w..
Optical fibre : Multimode or singlemode (FOTAG color code) Tube : Thermoplastic material Tube waterproofing : Gel Reinforcement : Glass yarns.. 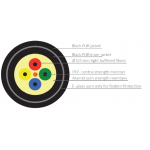 This specification covers optical cables with 2 or 4 fibers. LDD tactical cable is equipped with twojackets for excellent protection of tight buffered..
ACOLAN® Loose Tube 6 fibers – Indoor/Outdoor – LSOH Dielectric – Dry water tightness 62.5/125 OM1 The ACOLAN optical offer addresse..
1. 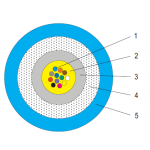 Optical fibre : Multimode or singlemode (FOTAG color code)2. Tube : Thermoplastic material3. Tube waterproofing :&nbs..
Optical fibre: Singlemode (FOTAG color code) Tube : PBT Polyester Waterproofing : Gel Reinforcement :Water blocking aram..
s specification covers optical cables with2 – 12 fibers. This cable type has a number of tightbuffered optical fibers, surrounded by a heavylayer of a..
OPTICAL CABLE MINI BREAK-OUT - 2 to 24 SINGLEMODES FIBERS 9/125 - IEC 60794-1-E3INDOOR/OUTDOOR 1. Optical fibers : Fibers insulated diamete..
1. Optical fibre : Multimode (FOTAG color code) 2. Tube : Thermoplastic material 3. Tube waterproofing : Gel 4. Reinforcement : Glass yarns ..
ACOLAN® Loose Tube 8 fibers – Indoor/Outdoor – LSOH Dielectric – Dry water tightness 62.5/125 OM1 The ACOLAN optical ..
1. 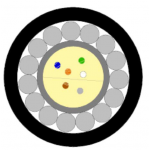 Optical fibre : Singlemode (FOTAG color code) 2. Tube : Thermoplastic material 3. Tube waterproofing : Gel &..